March 29th-31st there was a huge ELT event held here in Moscow organized by the British Council, the annual (2nd this time) E-merging Forum, aimed, of course, to connect teachers eager to share and learn and develop. So I decided to go and learn and develop – and share as well, given my recent courage and confidence =). Proposal being accepted 2 weeks before the event, I faced the reality or REALNESS of the fact: I was going (seriously) give my first talk ever. And I tell you, it was a whole BIG deal to me. So here’s how I dealt with it (the stress, the preparation, the moment) and then my brief account of the day I spent at the forum. When the talk was ready and the ppt was done as well..that was the moment I had dreaded..how is one supposed to rehearse the talk?! I find it hard to talk to myself and I cannot talk to walls and cups and notebooks. More than that, I had a feeling that I wanted to keep it fresh, well not TOO fresh (not raw), but not to be pressed by what I was going to rehearse at the talk was crucial, in my opinion. So what I did was what I remembered had been working for me during all the 5 years of university – process the same in different forms. * I wrote the talk pen&paper. * I typed the talk in a Word doc and printed it out. * I arranged the talk in the doc in a table format, one box for each slide/idea, printed out, cut, highlighted key words. 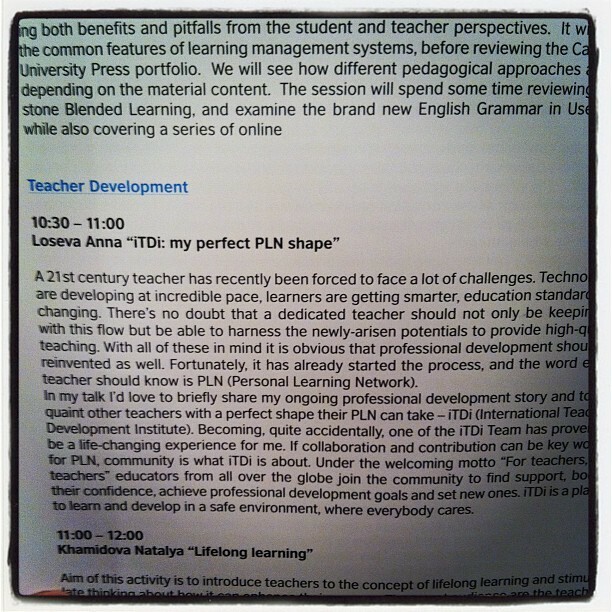 * I recorded my talk using “mybrainshark” tool (thanks to Sandy Millin for giving me the idea – her post of IATEFL talk). * I recorded the talk on my iPhone using “iTalk” App. * I sent the written version of the talk to my mail. * I wrote an outline of the talk on the paper. Two days were left before the Day. How did I use the above-mentioned ways? I read the outline twice. I read the talk (or rather skimmed through it) a couple of times. I told the talk to myself in the bathroom once. Another thing that I did was to cry for help)) I needed advice and practical tips from the people who know the thing. And because I have such an amazing PLN – I sure succeded (Facebook and Twitter being the medium connecting us)!! I did mention this in the talk as it serves a very vivid example of why PLN is so essential. talk to some people in the audience (early arrivals, those in the first row); they’re normal people!=) ask them some question in the beginning of the talk, CONNECT! do the presentation you would want to see! Wonderful ideas, aren’t they?! 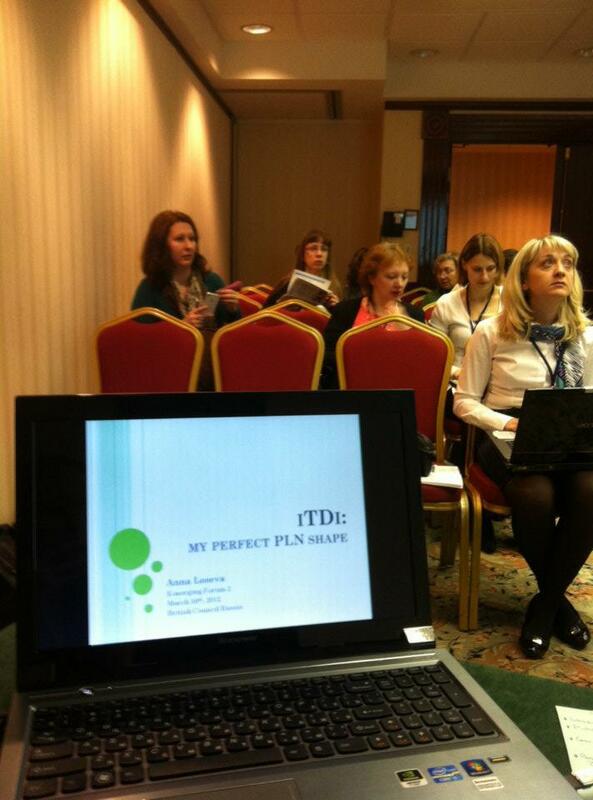 Of course, many thanks to people and iTDi, who cheered for me before, during and after the talk! That was clearly felt!! I was very excited and sort of “high” for the rest of the day which Sasha and me spent there at the venue. We attended several sessions, 2 plenaries and had lots of fun and did some networking. I met Nastya Fetisova, who was also giving a talk (she studied at the same university as me and used to teach my friends and is still teaching would-be teachers at my university). Sasha had been there at the forum the previous day and had a chance to enjoy Amos Paran’s plenary where he actually occasionally mentioned my talk, and so we came up to Amos and said hello and I think he’s so nice. Shame I could not be there for his plenary on using narratives in the classroom, I hear he engaged the whole audience in activities and it was a lot of fun. Why not rock E-merging Forum 3 in 2013 (end of March) together?! Is it possible for you to come to Moscow, with a talk or without it, enjoy the time, meet new people, explore my city, have lots of fun?! UPD: here’s the official album of the British Council with the pics from the forum, all 3 days, professional pics.